ABOVE: The lifts in Zermatt, Switzerland and neighboring Cervinia, Italy can accommodate 75,180 skiers per hour, and there's plenty of high-altitude snow to go around. Zermatt, in the canton of Wallis (Valais), has been a mecca for athletic vacationers since 1830, when Britain's Lord Minto led an expedition up Monte Rosa, got lost in a storm, and climbed the Breithorn by mistake. Today, it continues to draw alpinists who find the Matterhorn irresistible, but skiing and snowboarding have become at least as important as hiking and mountain climbing. The town claims more than 250 km or 156 miles of groomed ski and snowboard runs (many with snowmaking equipment), including the Italian trails that can be reached from Zermatt's lift stations. Although most runs are geared toward intermediates and experts, a number of easy trails do exist--including some that are quite long and scenic. Blauherd/Sunnegga and Unter Rothorn, which you reach via an underground funicular and a linked network of aerial cablecars. Gornergrat/Riffelberg and Triftji/Stockhorn, accessible by the Gornergrat cogwheel railway. Trails include a sled run and a children's ski park. Klein Matterhorn, Furgg, and Schwarzee, reached by an aerial cablecar system. 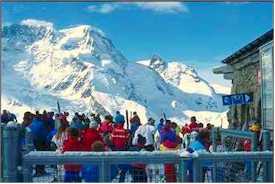 This area has summer skiing and provides access to the Breuil-Cervinia lift network in Italy. If you're adventurous and have deep pockets, try heli-skiing and other off-piste excursions with a licensed mountain guide. And if you prefer to ski away from steep slopes, gorges, or glaciers, try the 7-km cross-country loop near the edge of town. Non-skiers can keep busy on the marked winter hiking trails, by riding the ski lifts, or in shops that sell everything from Swatch watches to designer clothing. 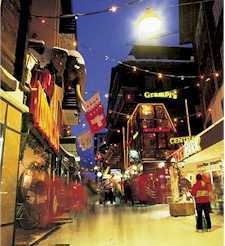 ABOVE: Zermatt's main shopping street. Although the days when cows outnumbered tourist workers are long gone, Zermatt feels more like a village than you might expect--probably because the tourist economy is family-based, with no skyscraper hotels to blot the skyline. Age-darkened wooden chalets (many of which have been converted to hotels or shops) make the town considerably more atmospheric than newer resorts like Crans-Montana and Verbier. Best of all, Zermatt is a car-free resort, although pedestrians need to keep an eye out for electric taxis and delivery trucks. There's plenty to do in Zermatt when you aren't schussing on the slopes. You'll find caf�s, bars, nightclubs, and restaurants in profusion. In short, Zermatt is a nice compromise between the townlike atmosphere of Davos or St. Moritz and a quiet village like Andermatt. Zermatt isn't an ideal resort for budget travelers, but it does offer a wide range of places to stay, from hotels in all price ranges to apartments, chalets, and other private accommodation. For guaranteed lowest available rates at more than 100 properties, see Booking.com: Zermatt. If you're on a short financial leash, you can try the Zermatt Youth Hostel, although it's a 15-minute walk uphill from the town center. The hostel has 174 beds. The pleasant and privately-owned Hotel Bahnhof is more centrally located, with dormitories and simple bedrooms. Zermatt is 3-1/2 to 4 hours by train from Geneva and about 4-1/2 hours from Z�rich, with a change of trains at Brig or Visp. If you're driving, you'll need to park your car farther down the valley. T�sch has parking lots and multistory garages, with minibus taxis and shuttle trains covering the 4.8-km (3-mile) distance to Zermatt. Another option is to use the free parking lot in Visp and buy a roundtrip train ticket for Zermatt. ABOVE: The Matterhorn, photographed from the top station of the Gornergrat cogwheel railway. The Tourist Office of Zermatt makes a good starting point for your trip planning. 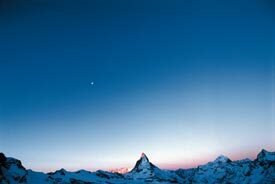 This is one of the most detailed Zermatt ski sites, with accommodations listings and an informative About Zermatt page. It also has sightseeing recommendations for summer travelers. Photos 3 and 4: Swiss-image.ch.